It’s Spring Break. We took a week away to rest as a family and now we are back with just less than a week at home to spend with friends and our wonderful extended family. I have had the opportunity to be with some dear friends the past few days and I am so thankful for it. With one we talked about our boys. She has a son who is Jake’s age. She shared some of their struggles with me. It made me feel so much better. We laughed together, with understanding, and with tears hiding just around the corner. It is so nice to hear someone else say, “I don’t know what I’m doing,” or to be able to be honest and say, “I feel I should have done better.” The tears are from the guilt, the feeling that somehow there must be more ways I can help my kiddo. I shared one story with her and I thought I could share it here. Jake, you see, is awesome with Lego. He is articulate and has a super vocabulary. He reads and does well at math. Yet, he struggles with cutlery. He really has a hard time with a spoon, but a fork? Forget it. He eats with his fingers, almost exclusively. For some meals, this is okay. Others, not so much. We are working on it. But there are times when I just wonder, have we missed something? Have we forgotten to teach him how to use cutlery? He can use a fork, but forgets without constant reminders. Forgets! Several times during a meal. It makes me wonder if the issue is muscle coordination, executive functioning and planning, or what. Penny already uses a spoon about as well as Jake, so I really don’t think it is a parenting fail, but it’s impossible to say for sure. There are specialized cutlery sets you can buy for autistic eaters. They are bright and grippy, with fun handles. I wonder if we should try them. It makes me think we can’t be alone in our finger food issues. It’s the kind of thing that wasn’t such a big deal when he was younger, we had so many other higher priorities. As he gets older, however, it makes him stand out, and it makes such a mess. Learning how to use cutlery will be an essential ability for him as he builds social skills. With dear friends and their kids over for dinner the other night, I was thrilled with Jake’s relaxed and comfortable attitude. He spent a long time talking with the dad and then another long time talking with the rest of the adults after dinner. He has been telling me since then that he “enjoys participating in adult conversations.” Meanwhile, Aiden played an elaborate make believe game in the basement for hours with the other children. I think he may have been a naughty cat, or a baby while the little girl played mom, I’m not entirely sure. However, it was clear that the game was full of pretend and completely lacking in rules and scripts. Both of my boys had a very special time. Penny ran around like she was a part of everything. She is going to totally grow up thinking that the world revolves around her despite the fact that she is the third in a family with loads and loads of noise and needs. She can’t help it; neither can we. Her joy is contagious, and everyone stops to look when she enters the room. We are so blessed to have friends that get us. People who don’t mind spending the evening with a six-year-old “adult conversationalist” who loves the attention and giving his opinion on our conversations. People who don’t flinch when he doesn’t join in with the other kids. People who bring their kids here to play with Aiden—I don’t know when he has had such creative control over his own imagination in ages. Friends who share their own kids’ struggles with me so I feel less alone. It’s awesome. Jake now eats his vitamins. The Star Wars games didn’t work. I think they were too complicated. We found a system, though, where he shows me “his moves” for a minute, powers himself up, so to speak, and then downs the vitamins. Awesome! It has worked consistently for about 12 days now and I feel like we have created a new routine that works. I am trying to use the words autism and autistic more in front of Jake, working them into conversation within earshot. Baby steps. The IEP meeting was great, and afterwards I felt much relief. He is really only struggling with social issues at school right now. We discussed enrichment for him. He really is such a neat kid. They spoke so positively about him. He’s sweet, polite, and kind. He is respectful. He is not defiant or interested in causing trouble. He doesn’t disrupt his classmates. The one day that he came close to a meltdown at school, his EA correctly realized that he was feeling overly anxious and provided him a chance to calm down and reset, avoiding a potentially bad situation. Apparently the other students all get along with him and like him. I am going to work at having some more social opportunities for him, playdates and stuff. I don’t want to overload any of us, though. We have also started Tae Kwon Do with both Aiden and Jake, and that adds more stuff to our routine too. It was really hard to get Jake into it. His dad did Judo as a teen, and won several medals that the boys love playing with. His cousin also does Judo, so naturally Jake thought that Judo was the only martial art that is acceptable. Unfortunately, where we live there is no Judo offered, Tae Kwon Do is our only option. We watched some videos on YouTube of kids practicing and Aiden was sold. He was so excited he could hardly stand it. The first class he was beaming the entire time. Jake, however, refused to participate, and we agreed that he could observe and hoped that he would come around. The benefits were so obvious. There were much older kids, teenagers, mentoring the beginners. The relationship possibilities thrilled me. There was a great focus on practice and support. There was a lot of structure and repetition. There were clear goals and rewards in place. I just felt like it was exactly the extra-curricular activity for us. Jake was still not sold. And so we turned to our standby for such situations. Bribery. 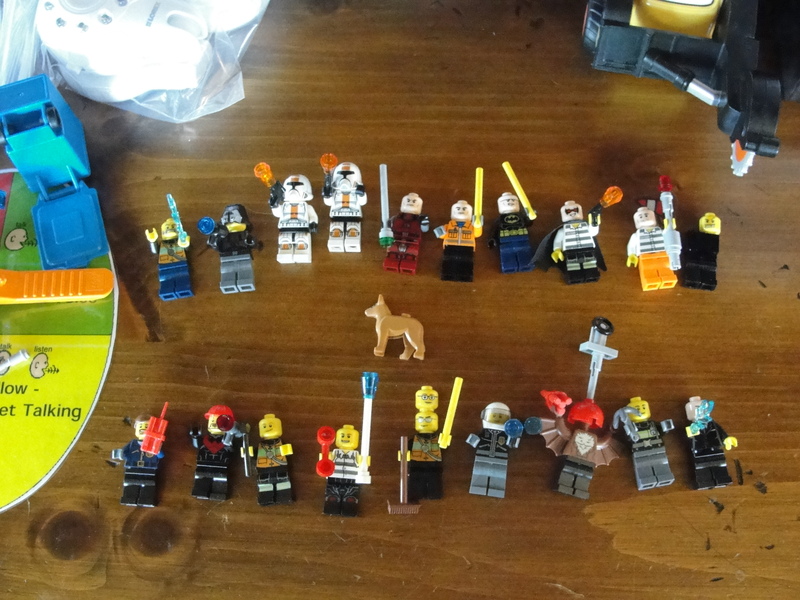 We agreed that if both boys participate in 35 Tae Kwon Do classes, we will buy them a big Lego Star Wars set. Well, I had barely whispered the idea and Jake was all of a sudden completely turned around and ready to go. He had to wait three days before he could finally participate. Oh! He’s so funny. And so, they both went. They did great. They learned lots, and Jake was already correcting Aiden on Tae Kwon Do etiquette. They came home and put shiny stickers on their new 5×7 sticker grids that we printed to chart their progress. Jake has missed parts or all of eight days of school due to fevers. I am jumping into the gluten free/casein free diet in hope of making a difference with this and I have no other ideas. We are working as a family to try to slow down and make time for him to relax and play. I have booked an appointment with his new pediatrician to discuss it but it isn’t until November. All in all I feel quite frustrated and helpless with the fevers. They are so hard on him. The other change around here is that all of a sudden, Jake is reading. At the Meet the Teacher night, his teacher suggested that if we read with our kids for eight minutes a day, four days a week, they could earn a reward. I am motivated by rewards just like my munchkins, and so I did not want Jake to miss out. I pulled out the reader he brought home, and like nobody’s business, he read it! The next day I tried him on something less familiar, digging out Green Eggs and Ham. Sure enough, he read that too! The first half, anyways. Tonight he read Go Dog Go to his dad. I am incredibly impressed. That teacher, she is teaching him to read! He is getting it and is so proud. He was just grinning so adorably tonight. I’ve heard that there is a light bulb that goes on when kids learn to read. I had no idea how amazing it is to watch. It’s so good. I am so proud. There is so much evidence of God’s love here and we are so blessed. One of the things I struggle with the most is the feeling of frustration and loss of control when Jake is insistent on doing something his way, or exclusively. For example, this morning, I wanted Jake to take his vitamins and eat his lunch. In a timely way, so that we would be able to get ready and leave for school on time. Jake stood, looking at his vitamins, bouncing on his feet, eyes flickering, for what seemed like eternity. It was probably about 10 minutes. He said he just needed to think about it. He said he needed to remember what they tasted like. He said he needed quiet. He said he had to build a fort first. It was exasperating. It was mental. And it was followed by him sitting down at the table to eat his waffles. Which he couldn’t eat. Because he had so much to say. Literally, he took one bite in ten minutes. And talked non-stop the rest of the time. Eventually he both took the vitamins and ate his breakfast. And went to school. However, I am left exhausted, unsatisfied, feeling guilty, bothered, and frustrated. I imagine he felt much the same. All before 9 am. I have been rereading Raun K. Kaufman’s book, Autism Breakthrough. It is loaded with incredible ideas and insights. It focuses on putting the parents squarely in charge of the changes they want to see in their autistic children, which is a huge weight. But I cannot deny the common sense of what he says. He also focuses on loving our children respectfully, building meaningful, trusting relationships with them, and showing them all of the best reasons to want to learn to be more social. Playfully invite Jake to participate in a game designed around something HE LOVES and the goal. Keep playing the game as long as you possibly can, adding layers of challenge. 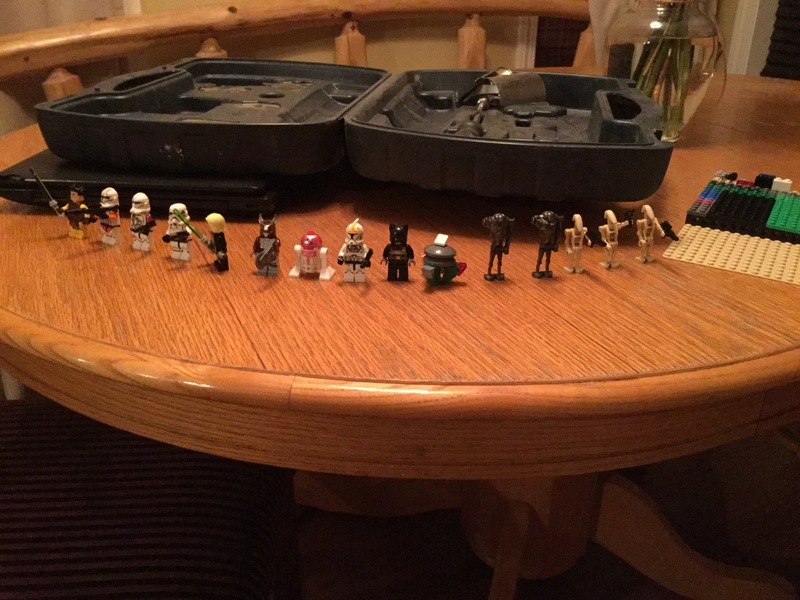 Start my own game based on Star Wars. Playfully invite Jake and Aiden to play my game and include the vitamins, as maybe, super Force power-ups. Keep playing the game, suggesting they have to eat the breakfast in small sections before they battle the next bad-guy. A series of awesome Lego people. I think my favorite is the one with two heads. Hard to decide. It requires a level of energy and enthusiasm I don’t feel first thing in the morning. It requires creative thinking on the fly, which means that my mind has to be moving quickly, very quickly, as I will also be trying to eat my own breakfast and feed Penny. The payoff could be that we are all happier, breakfast gets eaten, and no one starts the day feeling crummy. I’m in. Isn’t this exactly what I’ve been saying? That I would do better? That I would get myself in gear and really figure this out? Okay, I’m in. I read a beautiful post today about trust. It was written by a mom, about her father and her daughter and how over time they have developed a trust where even though the little girl is autistic and dislikes being touched, they can share an embrace. She explained how when we love someone so much that we can hardly breathe because we just want to hold them, sometimes the best way to show that love is to restrain ourselves until we can develop the trust that is needed. Like I said, it was beautiful. Jake and I struggle with trust. When he was younger, when I didn’t know about autism and what he actually needed, I pushed him too hard. I tried to get him to try new things, even when it became clear that he really didn’t want to. I tried to get him to be adventurous, to take a risk, to jump into a pool, for example, when he really, really didn’t want to. I am sorry now. I am working so hard to earn his trust. Most of the time I can see that he does trust me. He loves to be held and snuggled by me, so long as I respect the “not too tight” rule. He loves to look into my eyes, and I love to look into his, as long as I wait for his initiation and am not also trying to talk to him. But then something comes up that I don’t understand. And I struggle. Today it was French fries. Jake loves fries. Loves McDonalds fries, Arby’s fries, restaurant fries, homemade fries. He loves straight fries, crinkle cut fries, and yam fries. He loves fries with the skin on and fries with no skin. He loves those tasty taters that are essentially balls of fries. So his sweetheart of a grandma made him some very special alphabet fries. They were gluten free, casein free, totally healthy and totally fun. We spelled his name. But nope, he would not eat those fries. I didn’t get it. And I didn’t let it go. He was being rude, refusing to eat them. He said his tummy was full. And then he asked me for a Popsicle. Not going to happen, buddy. We took the fries home, telling him that he would eat those fries before he was allowed to have anything for a bedtime snack, he would eat those fries for breakfast if he had to. Well. They were too curly and strange. He was worried that they would make his stomach curl and be sick. They were not the right shape for food to be. That’s when I clued in. This is not about food. This is about autism. He is autistic. He can’t eat strange fries. They have to fit into the idea of fries that he has, that he knows. Strange things are scary. Strange things are unknowns and that is scary. I am scaring him. He doesn’t trust this food and he is scared and crying because he thinks I want him to eat something wrong. So, we calmed down, and talked about fries and how they are made, and how I ate them and they were good. Then we broke them into straight pieces that resembled what fries should look like and he ate them without difficulty. Except for the S and the R. They were just too curly. And that’s okay with me. I am going to get it. I am going to earn his trust. I just have to trust him. I have to ask him and I have to listen to him. It goes both ways. It’s a hard lesson for me. But I can see the payoff. 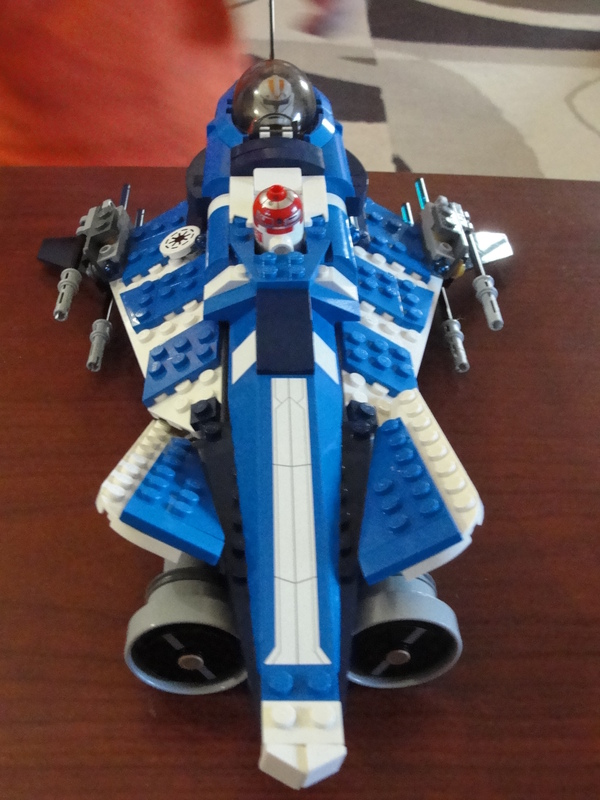 Jake received this Lego set for his birthday and his loving aunt spent ages building it with him. Building trust. right! Stories of trust earned by learning how to really love each other and show that love through restraint and patience inspire me. I want to respect Jake and what he is experiencing. I want him to trust me so that he can stretch and become more flexible, because he trusts me, not because he is forced into it. I will need to breathe more.